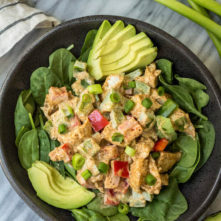 I wanted a light protein salad to keep on hand in the fridge this week for easy lunches. I’m a little burnt out on my typical chicken salad. 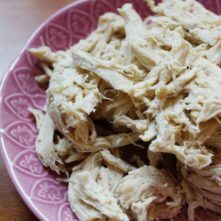 I swear I go through phases where cold chicken salad is all I want to eat for weeks at a time and then one day even the thought of it grosses me out. 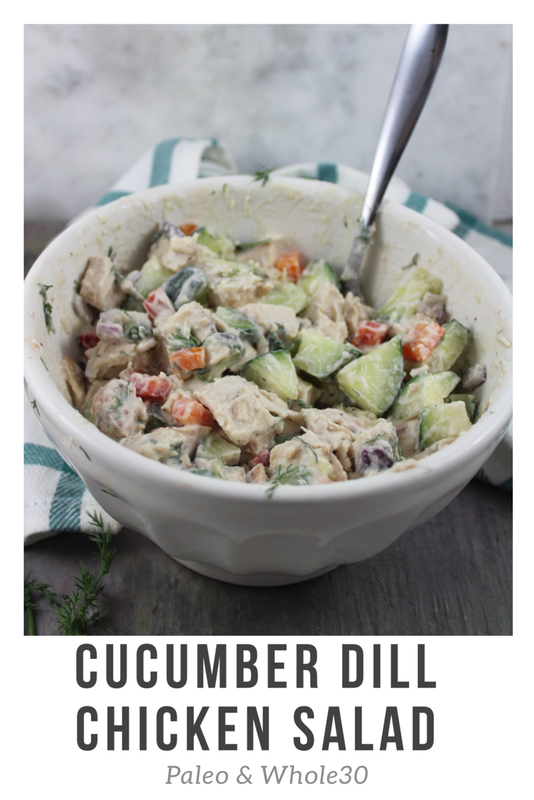 So to solve that little dilemma, I made an equally easy cucumber dill chicken salad. 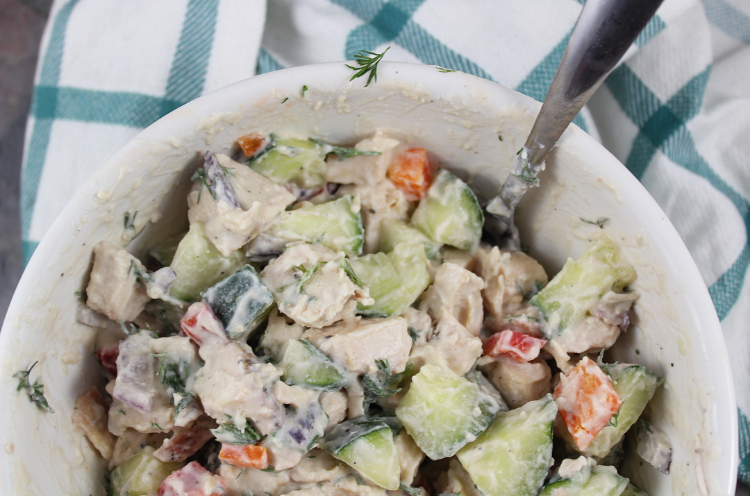 The best part about this cucumber dill chicken salad is that it gets better the longer it’s left in the fridge. The dill starts to really integrate with the rest of the ingredients, making the whole salad super flavorful and delicious. I like keeping these sorts of salads around because it makes figuring out lunches or post-workout snacks really easy. I can just scoop some out over whatever greens I have on hand or eat it plain without having to cook or plan out much of anything. Instead of mayo I used coconut cream. 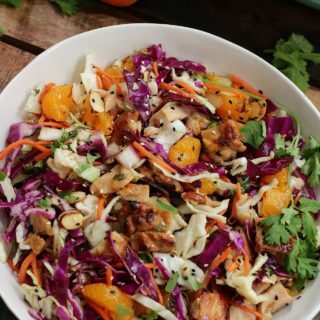 The coconut cream makes this salad light as opposed to a heavy mayo. The dill mostly removes most of the coconut flavor. But if you aren’t a fan of coconut you could replace it with mayo. This would be a good dish to bring to all of the outdoor parties you’re going to start going to here soon, now that we’re finally heading into warmer weather. If you’re not strictly Paleo, you could add pasta shells to it to give it more oomph if you’re bringing it to a get-together. People love pasta salads. I got a GIANT cucumber from the Farmer’s Market (hellllloooo, sure sign of summer!) that I used for this recipe. I swear this cucumber has GOT to be a world record holder. It’s diced up in my fridge now though so you’ll have to take my word for it. Anyway, I used 1/2 of this large cucumber so I made a note in the recipe to use the full cucumber if you pick up a normal/medium sized cucumber that doesn’t come with any trophies ;). 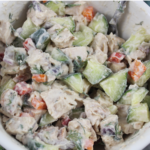 You’re going to want a fairly equal ratio chicken to cucumber so that should help you evaluate how much cucumber to use depending on the size. Double the recipe if you’re feeding a crowd!